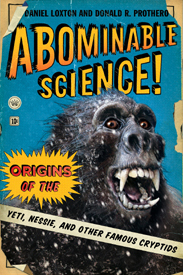 Daniel Loxton and Donald Prothero’s Abominable Science! Origins of the Yeti, Nessie, and Other Famous Cryptids is an admirable book. I admire it immensely. I have used it in my freshman writing classes. If you haven’t bought it already, I encourage you to do so immediately. However, I have some reservations about Loxton’s chapter on Sea Serpents. In chapter 5, “The Evolution of the Sea Serpent: From Hippocamp to Cadborosaurus,” Loxton argues that the classical hippocampus, hippocamp, or hydrippus is behind legends of sea serpents. The hippocamp is a sea monster that is part horse and part fish (or vaguely fish-like). 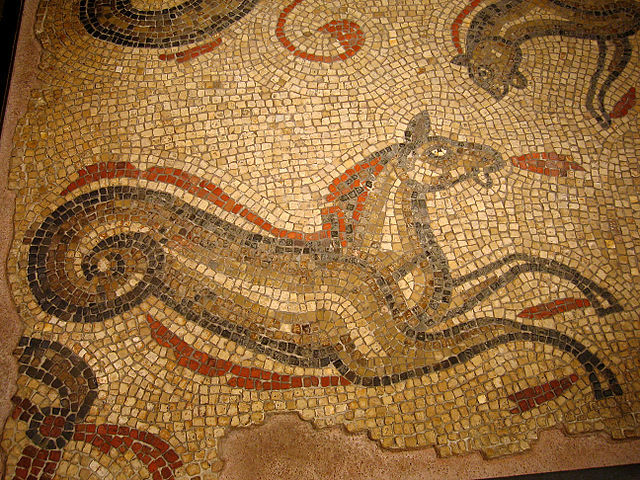 “Roman Baths, Bath – Sea Horse Mosaic“. Licensed under CC BY-SA 2.0 via Wikimedia Commons. Loxton says that hippocamps “were not gods. They were not characters in myths. Most important, they were not believed to be real animals” (AS 188). At least not originally. The image of the hippocamp spread throughout the Roman Empire. The image above comes from a mosaic in Bath, England. The hippocamp also appeared in the Physiologus, a didactic text written in the second century that allegorized animals (real and mythological), plants, and stones.The Physiologus was copied, adapted, and translated over and over again. The oldest vernacular version is in Old English. This verse version from the Exeter Book describes only three animals: the panther, the whale, and the partridge. The Physiologus also influenced medieval bestiaries, lavishly illustrated compendia of mammals, fish, birds, and serpents, both real and imaginary. Many of these also include hippocamps. However, they also include a wide variety of serpents, including dragons. Some of these, such as the critter identified as a hydrus below, resemble sea serpents. 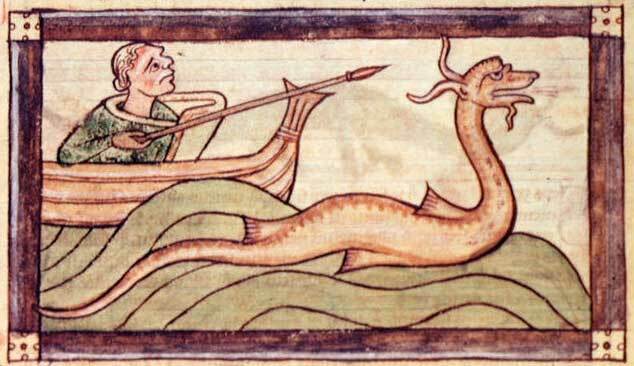 In a section subtitled “The Hippocamp in Nordic Culture,” Loxton says that the “modern sea serpent legend was born out of Nordic culture, with its origin in medieval Iceland and its florescence in Enlightenment Norway.” It is with this section that I have serious quibbles. By the twelfth century, the Norse society of Iceland had adopted a belief in a creature called the hrosshvalr (horse whale), which was depicted as an unmistakable hippocamp. We will see that this innovation–the Nordic reimagining of the Greek hippocamp as a maned, horse-headed “real” marine monster–is a key to solving the modern mystery of the Great Sea Serpent. (AS 193). While Loxton notes that scholars “have tended to identify these creatures as walruses or sea lions” (194), he points out that, according to the description, they are much too large (thirty or forty ells–67 to 90 feet). While the description does not fit real pinnipeds, there’s nothing particularly horsey about the description either, except for the element hross in the animal’s name. And, since we know the word hrosshvalr could mean “walrus,” we can’t leap to the conclusion that it refers here to the hippocamp just because the first element in both compounds means “horse.” The creature’s size could be an exaggeration, along with its willful enmity toward humans. 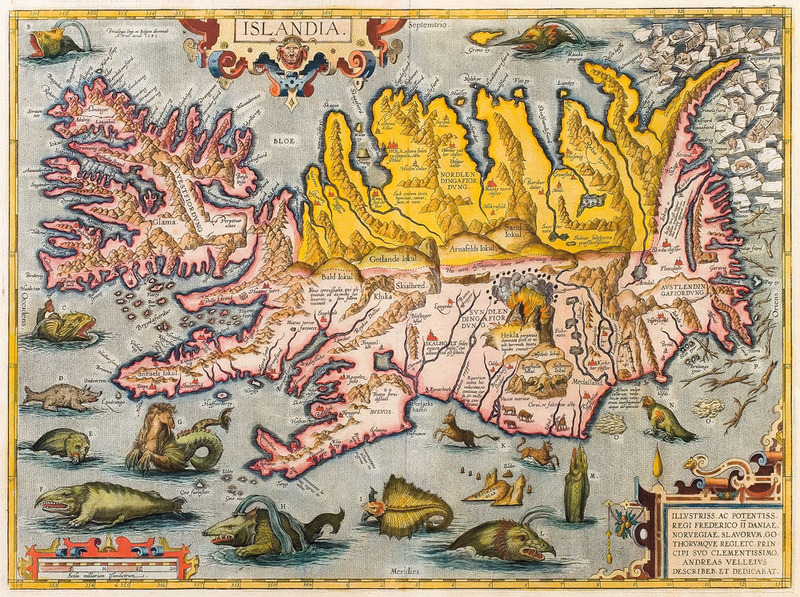 A stronger link between the hrosshvalr and the hippocamp comes from Abraham Ortelius’s map of Iceland. The sea surrounding Iceland is positively teeming with monsters. Just below Snæfelsness is a very horsey looking hrosshvalr. The problem is that Ortelius was a Flemish cartographer working in the late sixteenth century. He is not a medieval Icelander depicting a native beastie; he is a Renaissance artist representing another culture’s folkloric monster. He has made the Icelandic hrosshvalr into a classical hippocamp. Renaissance artists classicized everything. Loxton fails to provide convincing evidence that medieval Scandinavians interpreted or depicted the hrosshvalr as “an unmistakable hippocamp.” This is problematic as this association is crucial to his argument. For instance, in his discussion of Olaus Magnus’s A Description of the Northern Peoples (1555), he says the book “provided the final stage set for the modern sea serpent (although the curtain would not fully open for a further 200 years). 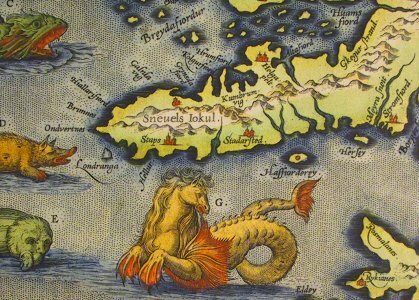 By then, the Scandinavian reimagining of the Greek hippocamp as a ‘real’ sea monster was itself a centuries-old tradition,” but the evidence for this centuries-old tradition is extremely weak. In the next section, Loxton discusses Jörmungandr or Midgarðsormr, the World Serpent, a mythological Norse sea serpent that in no way resembles a hippocamp. An offspring of Loki and the giantess Angrboða, the World Serpent lies in the ocean and encircles the earth. Loxton admits that “[i]t is certainly plausible, even likely, that the Jörmungandr myth could be among the roots of the Norwegian sea serpent legend. In turn, the Midgard Serpent can be plausibly interpreted as a regional iteration of primordial dragon myths, such as the Babylonian Tiamat and the biblical Leviathan” (197), but he minimizes its importance, mentioning it only briefly before returning to the hippocamp. I’m not sure why it is important to note this. Is the Prose Edda’s description of the World Serpent untrustworthy because it has been tainted by Christianity? Even if this were the case, how is that different from the alleged influence of the classical hippocamp on the native hrosshvalr? In any case, the statement is incomplete to the point of inaccuracy. It’s true that Snorri Sturluson, the author of the Prose Edda, was a Christian. It is also true that he began his work with a concise summary of Genesis and that he euhemerized Norse mythology as part of the framework of the Edda; however, once he began recounting the mythological stories, he just got on with the job, without constantly moralizing and euhemerizing (unlike Saxo Grammaticus, another major source for Norse mythology). It is also true that Snorri may have misunderstood some elements of the mythology he was recounting; he certainly conflated and interpreted the material he gathered from his various sources. Consequently, our concepts about Norse mythology may be somewhat skewed and may not match the beliefs and rituals as they were actually practiced by pre-Christian Germanic peoples. But not the World Serpent. The World Serpent is well attested in works earlier than the Prose Edda. One of the most famous stories about the World Serpent concerns Thor’s attempt to catch it during a fishing expedition. This story is told in Hymiskviða from the Poetic Edda. The exact age of the poems in the Poetic Edda is a matter of dispute. There are also questions about how much they were altered in transmission, but Thor’s fishing expedition is mentioned in earlier skaldic poems, such as Bragi Boddason’s Ragnarsdrápa (ninth century) and Úlfr Uggason’s Húsdrápa (tenth century). Both these poems were composed before the conversion to Christianity. 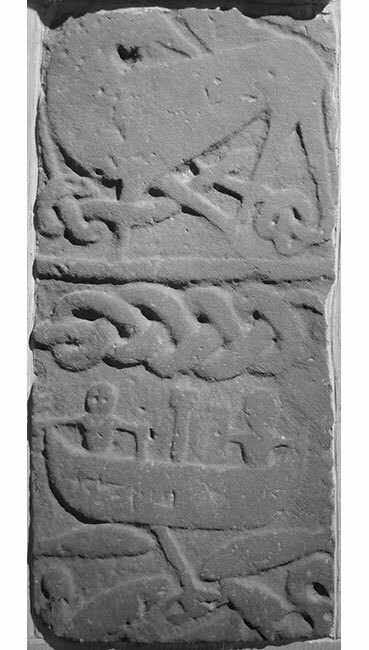 Of course, they are preserved in later, post-conversion works (Snorri quotes them), but there are also several early carvings which depict the World Serpent and Thor’s fishing expedition. The World Serpent clearly goes back to pre-conversion Germanic traditions, and it seems to have been the source for some later sea serpent tales, such as that of the Stoorworm. In the next installment, I will discuss other Germanic sea serpent tales. This is an oddly cherry-picked account of Glam’s activities. He also kills both animals and people, sometimes breaking every bone in their bodies. The battle between Glam and the protagonist Grettir is described at some length and is very similar to the fight between Beowulf and Grendel. Before Grettir cuts off Glam’s head and burns his body, Glam makes a speech, cursing Grettir. There is no naturalistic explanation for this corpse’s behavior, and it can’t be dismissed as an interpretation of physical evidence. Glam’s activity is integral to the story and crucial to the formation and understanding of Grettir’s character. How could anyone think that mortals like Perseus, Beowulf, and St. George actually fought dragons, since dragons don’t exist? Strange though they sound, however, these “myths” did not begin as fiction. Barber shows that myths originally transmitted real information about real events and observations, preserving the information sometimes for millennia within nonliterate societies. Considering their focus on oral cultures, the very short-shrift the Barbers give to some of the most important scholars of oral tradition is somewhat disturbing. Neither Walter Ong nor his extremely influential book Orality and Literacy merit a mention. Nor do Eric A. Havelock or John Miles Foley. Even Milman Parry and Alfred Lord receive only the briefest of mentions, and Lord’s monumentally important work, The Singer of Tales, is not mentioned at all. On the other hand, they seriously cite other works of a slightly more fringey nature, such as Hamlet’s Mill, by Giorgio de Santillana and Hertha von Dechend. The Golden Calf, they suggest, derives from the Egyptian conception of the sky as a giant cow-goddess, “which could well have been known by folk who had lived in ancient Egypt for centuries. . . . In worshipping [sic] a Golden Calf at dawn, the Children of Israel would simply be reverting to Egyptian sun-worship: they were probably relieved that the sun finally came up, after all that thundering during the night” (Barber and Barber, chap. 3). They seem to be suggesting that the story of the Exodus is historically true to some significant degree: the Children of Israel were kept enslaved in Egypt; they escaped during a time of dark portents; they wandered in the desert, and, in difficult times, they began to worship the deities of their captors. There’s just one teeny-tiny problem with this: the stunning lack of documentary, historical or archeological evidence that a large number of Israelites were enslaved in Egypt or that they wandered through the desert for forty years. The Barbers make a number of dubious arguments (flood stories are really about the precession of the equinoxes), and, even when there may be some truth to their theories, their interpretations are monolithic and reductive, suggesting that there is a single source for a given myth, a single answer to a complex question. (1) Someone steals a cup from an old barrow. (2) Fire erupts from the barrow and spreads. (3) Near the stone entrance, our hero stabs blindly at the source of flames while shielding himself (ineffectively) from them. (5) People stab deeper, and eventually the flame goes out. One might argue that the Barbers themselves are adding “explanations” when they say that Beowulf stabbed “blindly,” and they have certainly left out a whole lot of detail. Why, they’ve left out an entire dragon. Except that’s not exactly true. The dragon is not visually described in detail, but it is described. It is referred to several times as coiled (hringbogan, l. 2561, coiled creature; ða se wyrm gebeah/snude tosomne, ll. 2567b-2568a, then the worm quickly coiled itself together; Gewat ða byrnende gebogen scriðan,/to geschipe scyndan, ll. 2569-2570, then, coiled in burning, it went gliding, rushed to its fate). hreas on hrusan hordærne neah. [Beowulf’s] slayer also lay dead, the terrible earth-dragon, bereft of life, oppressed by evil. The coiled worm could no longer control the ring-hoard, for iron edges had carried him off, hard battle-sharp remnant of hammers, so that the far-flyer, stilled by wounds, fell on the ground near the hoard. Not at all did he go flying through the air in the middle of the night, glorying in treasures, showing his form, but rather, he fell to the earth on account of the handiwork of the war-chief. For three hundred years, no one could inspect the hoard, in part because no one knew it was there, but also because there was a big old dragon lying on it. Wiglaf, however, is able to examine the hoard and bring back selected items to show the dying Beowulf because the two of them had killed the dragon. The passage above says that the dragon fell dead near the hoard. Near it, not on it. Wiglaf can inspect the hoard because the dragon is lying dead nearby. He is not on the hoard as he had been for the last three hundred years. The passage above makes it quite clear that there is a dead dragon lying around: bereft of life, it rests in peace. It’s shuffled off this mortal coil. It’s run down the curtain and joined the choir invisible. This is an ex-dragon! Is it possible that marsh gases from sealed graves played a role in the evolution of the fire-breathing dragon? Maybe, but I think it’s clear that there is more to the story than this. More importantly though, the Barbers “strip down” Beowulf to a point that it is no longer Beowulf. They are not simply removing interpretation from observation, as Paul Barber did in his examination of official accounts of vampire exhumations. They are stripping away anything that doesn’t fit their theory and overemphasizing anything that they think does support their ideas. They are cherry-picking and, to a large extent, they are telling their own story, not the one the Anglo-Saxon poet told. I recently wrote about the ways some Young Earth Creationists interpret the monsters in Beowulf to support their worldview. What the Barbers are doing seems precious little better. Unlike the Creationists, though, they are real scholars–they should do better. Barber, Elizabeth Wayland and Paul T. When They Severed Earth from Sky: How the Human Mind Shapes Myth. Princeton UP, 2004. Kindle edition. No page numbers. Barber, Elizabeth Wayland. When They Severed Earth from Sky: How the Human Mind Shapes Myth. Skeptics Society Distinguished Speakers Lecture Series, California Institute of Technology, Mar. 6, 2005. DVD. Barber, Paul. Vampires, Burial, and Death: Folklore and Reality. New Haven: Yale UP, 1988. Klaeber’s Beowulf and the Fight and Finnsburg. 4th ed. ed. R. D. Fulk, Robert E. Bjork, and John D. Niles. U of Toronto P, 2008. All translations are mine, except where indicated. Siebert, Eve. “Monsters and Dragons and Dinosaurs, Oh My: Creationist Interpretations of Beowulf.” Skeptical Inquirer Jan./Feb. 2013. What do you think the chances are that this actually happened? Less than none, I’m betting. Congratulations! You’ve earned your critical thinker merit badge! A similar story has been sitting on my desk for quite a while, and it’s time to purge it from my “to do” list. 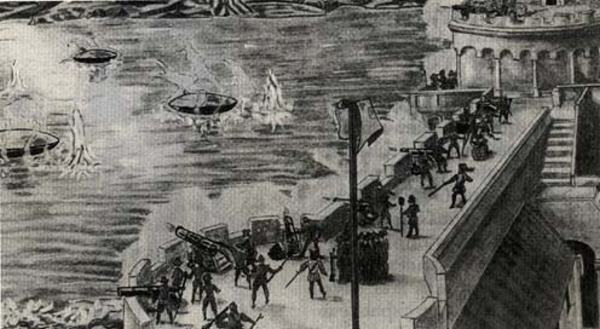 Did you know that there was a massive battle between the Genovese military and UFOs in 1608? Me neither. This story seems to pop up every few years on the Internet, especially in forums where people are looking for evidence of otherworldly visitations long before the 20th century’s first flying saucers appeared. What UFOlogists are looking for in these apparitions are depictions that are “uncontaminated” with modern notions of UFOs. At first glance, this logic might seem to make sense; however, UFOlogists seem to forget that their interpretations of these sightings are still contaminated with expectations wrought of modern UFO lore. The post that first brought the Genovese story to my attention appeared on Above Top Secret. The source of the story, Discours des terribles et espouvantables signes apparus sur la mer de Gennes, was written shortly after the reported events, and several versions are available online. I faced a couple of barriers when I decided I wanted to look into this story. First, my 17th-century Mediterranean history is a little shabby (as is yours, admit it). Second, I don’t read archaic French. I ran the original test through Google Translator, and found that Google doesn’t either, translating the title into: “Speech and of the terrible espouvantables signs appeared on the Mer de Gennes.” Third, I’m not all that familiar with the specific type of publication, a “chapbook,” that this account first appeared in. Fourth, except where people are simply copying and pasting modern interpretations of the supposed UFO encounter, there seems to be no single, straightforward, consistent or universally agreed upon modern translation. As is often the case with folklore, embellishments and additions accumulate, and this is complicated by the fact that the French text has been subjected to numerous translations; take the ATS source above–it seems to be a translation from archaic French to Italian to English. Where to start? Oh, as they say, merde. The first thing I’m going to do is not worry too much about which modern version of the story I choose as my starting point. When we eventually go back to the earliest versions of the story, whatever we learn there will shed light on the accuracy of all subsequent versions. So, let’s start with the event as it is described by Albert Rosales at UFOinfo.com in his catalog of ancient UFO sightings. Locals reportedly saw a bizarre creature emerging from sea right off the coast. It was described as a human shaped figure covered in scales and with what appeared to be “snakes” protruding from its hands. Canon fire was directed towards the creature without any apparent effect. Around the same time off the coast of Nice in France fishermen saw an object that descended towards the sea, a blood-like substance was seen to drop from the object. 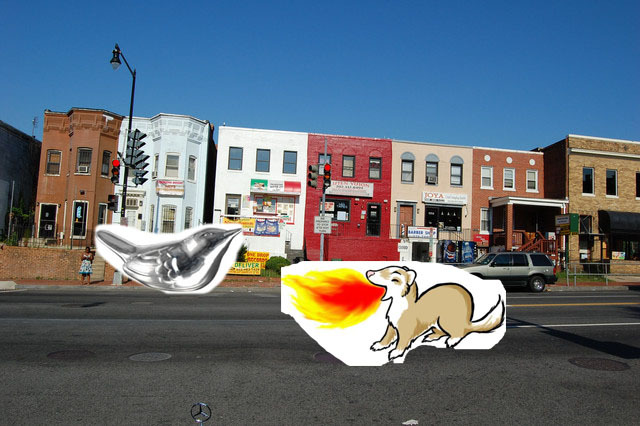 Others saw three “vessels” moving at high speed above the city. The three vessels then approach the local fortress and descend to the water causing a great boiling of the sea and emitting ochre-red vapor. To the great stupor of those present, two humanoid beings, with large heads and large luminous eyes dressed in red scaly combination outfits emerge from the vessels. These humanoids appeared to be connected to their vessels by long tubes. The humanoids spent several hours involved in “strange” work around their vessels. Meanwhile soldiers in the fortress shot cannon at the intruders without any apparent effect. Three days later, a single vessel appeared near Marseilles over the fishing village of Martigues, and again displayed the same erratic flight maneuvers that had been displayed over Nice. It stopped in midair and two beings got out, appearing to engage in an aerial duel of some kind. The following week there was a heavy fall of red rain, and in the months after churches were packed with worshipers begging to be spared whatever disastrous fate that was about to befall them. While accounts of these events are sometimes ambiguously worded, it is remarkable that so many people in three separate locations could have imagined such strange occurrences at a time when no flying machines existed. HC addendum Source: http://www.subversiveelement.com/UfoNiceFrance.html Type: B? It would be remarkable if so many people in different locations could have such experiences independently of one another in such a short period of time. But that’s not what we have here. We have a single account, variously republished in a number of chapbooks (or “canards” in French–I believe the English term only arrives later). Chapbooks were inexpensive little books meant for wide popular consumption, not durability (much like modern newspapers are not meant to last, but be printed in volume). There could be as few as eight pages in one of these little pocket-sized books. As I said, there are a number of retellings/partial translations of the purported source, identified as the Discours des terribles et espouvantables signes apparus sur la Mer de Gennes on a number of UFO sites, but I can’t rely on them to check the story’s accuracy. The first thing to do is identify the original. I enlisted Eve’s assistance, which is always a good idea. We first noticed that a surprising number of editions of this story exists, most dating from 1608 and 1609. Most printings actually provide a city of publication and refer to the source of the text it is republishing. A chapbook printed by Parisian bookseller might read: “Jouxte la copie de Lyon” (“following the Lyon edition”). Ideally, you would be able to work backward through the various editions to get to the source; however, in this case, there are references to more editions than actually seem to have survived. We found that one version had been copied from a Lyon printing, but we could not find any reference to any extant copy of that edition. Eve and I turned the Internet inside out…hitting WorldCat, GoogleBooks, JSTOR, every dang database and resource at our disposal to try and find it. No go. All was not lost, however. While we seemed unable “follow the begats,” as it were, back to the original, we did find that these earliest versions of the story were remarkably consistent with one another, with changes barely more substantive than varied spellings, which at any rate had not yet been standardized. The remarkably stable text suggests a common source. Even if we can’t go all the way back to the purported “Genoa” edition, we can look at the editions that do exist and come up with a pretty faithful version. And by “we” I mean “other people,” namely, my co-editor Eve, fellow Brittain postdoc Jennifer Orth-Veillon, and Yannis Deliyannis. This is sort of close. In the original, however, a variety of monsters appear, popping up in the ocean with two snakes in each hand. Some are in human form and some are more dragon-like, and they are all covered in scales. Also, Rosales does not mention the terrifying cries that these creatures are supposed to have emitted. Most importantly, while UFOlogists always mention that canon were used against the apparitions (perhaps the idea that the military got involved suggests authenticity to them), they never mention what is called the “true remedy.” The Capuchins order processions, fasting, and the saying of the Forty Hours, the latter being the “nuclear option” of penance. These details demonstrate that within the story, the apparitions respond to prayer, underscoring the religious, not factual-historical, nature of the text. I take it back; Rosales’ account is not close at all. No. This is wrong. No flying object is associated with the rain of “true and natural blood” described in the Discours. There are no fisher-folk. What is reported is a rain of blood throughout the south of France. The phenomenon of a “red rain” is well-known. In August and September 2001, a widely reported red rain fell in the Indian state of Kerala. Despite widespread accounts that alien cells discolored the water, the real culprit seems to have been “lichen-forming alga spores of local origin.” Red rain can also be caused by wind-born red dust and by other terrestrial mechanisms. The red rain in the south of France, as far as I can tell, is the only event in these stories that is historically verifiable. The naturalist Nicolas-Claude Fabri de Peiresc investigated a red rain there in 1608 and decided that it was, charmingly, butterfly droppings. Others saw three ‘vessels’ moving at high speed above the city. The three vessels then approach the local fortress and descend to the water causing a great boiling of the sea and emitting ochre-red vapor. To the great stupor of those present, two humanoid beings, with large heads and large luminous eyes dressed in red scaly combination outfits emerge from the vessels. These humanoids appeared to be connected to their vessels by long tubes. The humanoids spent several hours involved in “strange” work around their vessels. Meanwhile soldiers in the fortress shot cannon at the intruders without any apparent effect. Three days later, a single vessel appeared near Marseilles over the fishing village of Martigues, and again displayed the same erratic flight maneuvers that had been displayed over Nice. Woah, cowboy! Erratic flight maneuvers? You’re just making things up there. Two men appear in the sky. They are armed and have shields (and no, not like the starship Enterprise). No vehicles, no UFO acrobatics. Two people engaged in combat for two hours, with a brief time-out for a rest. (I swear it’s in there.) A few days later, they are back, wailing on each other “so that they seemed like blacksmiths beating on the anvil.” The next day, they appear on horseback and do combat. On the third day, the combatants reappear, this time in fortresses in the sky. They fire cannon at each other for seven hours, and when the air clears of smoke and the smell of gunpowder, the men are gone. In the modern version of the story, then, we see a number of important elements suppressed, especially the religious significance applied to the events, the efficacy of prayer as a remedy, and the appearance of dragons. At the same time, elements that fit more closely into the modern UFO narrative are either stressed (“Look–things flying!”, “Look–lizard people!”) or added (“red scaly combination outfits” and EVAs). The modern story, at least as it is retold by UFOlogists, is nothing like the original. Being able to dismiss the modern version of the UFO story leaves us with another problem. Did strange beasties appear in the sky over the Mediterranean in 1608? Of course the hell not. Let’s start the analysis with what we would expect the record to reflect if these apparitions had occurred. There would be multiple, mutually confirming independent reports, including Church, civil, and military records, about the goings on. This type of archival research can only be conducted on-site. Luckily, Diego Cuoghi has visited the archives of Genoa to investigate the original story. He found no evidence that anything remarkable whatsoever was reflected in the Senate records of the day. Cuoghi’s research is really rather good, as he identifies the time and place when modern UFOlogists changed the story of the carriages to ovals and when the image of the battle was first–and forever–linked to the story: 1970s France. And let’s face it, with the exception of Tokyo, where this sort of thing happens every other day, someone would have mentioned Gamera and Zigra having it out on the front lawn. The Bibliothèque Nationale has some five hundred news-sheets, of the kind called ‘broadsides’ or ‘coqs’, printed between 1529 and 1631, date of publication of the first Gazettes. The stories found in these sheets, some true and some imaginary, some very long and detailed, others quite short and unprecise, differ considerably according both to the subject matter and to the author’s personality. Yet, they all have in common certain fixed characteristics — which they share with contemporary daily newspapers. But, the XVIth and XVIIth century reporters as well as their readers were more concerned with the ‘moral’ of the news item than with its novelty, its oddness or its sensational aspect. The analysis of this ‘moral’ contributes to a better understanding of those troubled times. So, it turns out that this type of literature was not meant to be taken literally, but understood in terms of the moral lesson it delivered; in the case of the Discours, the message is “pray and repent.” It should therefore not be used as evidence of alien visitation. *Deliyannis has found a probable sister text, an account of a Maltese dragon that contains similar language and themes as the Discours. He also identifies a possible historical event that might have initiated the story, albeit heavily embellished, though he cautions that his conclusion is speculative. Thanks to Eve, Jennifer, and Yannis for their critical contributions to this entry. Without you, nothing! Deliyannis, Yannis. Chronicon Mirabilium. Blog. You are currently browsing the archives for the dragons category.